I'll say that 2012 is all about creation. (Well, some may predict it's the end of the world, but let's put that aside for now). I'm planning to create artwork, brushes, greeting cards..etc. In short, they are all stuffs that you can download...until I run out of creative juice (again). For this purpose, I have invented a new section in this blog, I'd like to call DreamBig Design. The name is inspired by my undeniable need to always dream..not just regular dream, but big dreams. 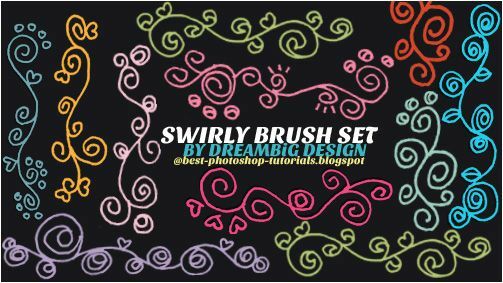 For today, I'm uploading a new set of Photoshop swirly brushes..freshly made from my doodle (sketch) yesterday. It is free for your personal use. If you decide to use it in your design, you're encouraged to drop me a link to it (if you don't mind). I would love to see it in action. This is my first time publishing my own brush set. You can tell that I'm pretty excited about it. SO CUTE! Thanks - I can't wait to play around with them! Thank you ;) Have fun with them!